Love this week's theme and I so wish I had a new baby to take photos of . . . alas, I had to dig in the coffer for a photo of a baby. What a lovely evening I have had looking at my babies as they have grown. 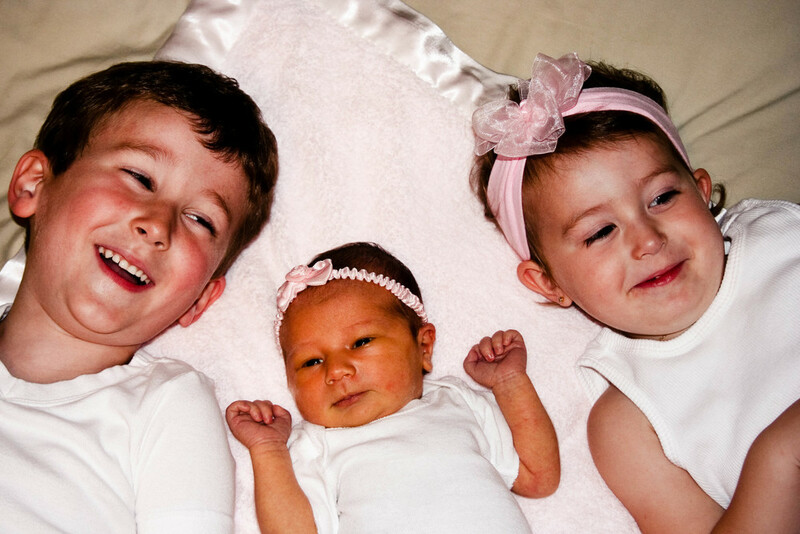 (and it is so funny to see the changes in my house over the past 8 years) I couldn't find a single photo of the most perfect baby photo because I think they are all so wonderful. (I think all mothers feel this way) Instead I decided to choose a photo that highlighted all my babies in one shot. This photo was taken the day I came home from the hospital with little baby girl . . . a day early because my husband was begging for me to be released and driving me crazy asking when I was coming home. He knew going in that I would be staying three days to recover from my C-Sect, my third one at that. Alas, that did not stop him from aggravating me into pleading with my doctor that I needed to go home one day early. (I blame him for my massive amounts of scar tissue). I was slow moving and hobbling around . . . but had it in my head that I must get this shot off of the three little ones to send out the birth announcements (that were all prepared and addressed, just waiting for the photo). I was standing on a chair over my bed giving orders to my husband on where and how to place the children and the blanket. The blanket is crooked underneath the children and I couldn't get any of my babies to look at the camera at the same time. My new baby ic completely jaundice and son and first daughter were not cooperating very well. I took at least 150 photos and this is really the only one that I like. It is the one I used on the birth announcements. Frankly, I have been on that same quest for the past 3.95 years as I was this first evening home . . . a mother to three children . . . none of whom will look at me at the same time.